The CSS box-shadow property can be used to give block elements a drop shadow or an inner shadow. Let’s take a close look at this CSS property. 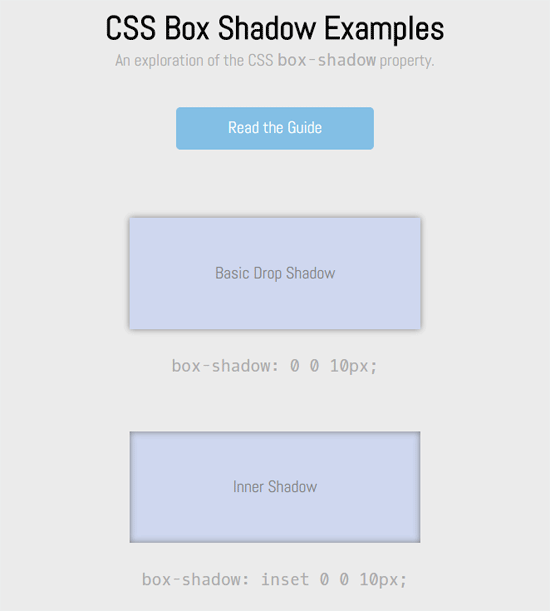 Below are three different examples of applying the CSS box-shadow property on a div. Here’s how you could give a div a subtle gray drop shadow. An inner shadow can be rendered using the inset property value. In this example, the box shadow is cast with a bias towards the bottom-right side of the box by using a horizontal offset and vertical offset of 5px. What if you wanted to have the shadow at the top-left portion of the box instead? We can do so using negative values for the horizontal offset and vertical offset. In the following example, the horizontal offset and vertical offset is set to -5px. Now that you’ve seen a few examples of CSS box-shadow in action, let’s dig a little deeper. Only two property values are required: the horizontal offset and the vertical offset. The color value must be a CSS color unit such as a hex value (e.g. #000000). inset No keyword If inset is not specified, the box shadow will be outside of the HTML element. horizontal offset Yes length No default value. It must be specified. vertical offset Yes length No default value. It must be specified. color No color Equal to the color property of the HTML element/s that the box shadow is being applied to. If the inset keyword property value is present, the box shadow will be placed inside the HTML element. The horizontal offset value controls the x-axis position of the box shadow. A positive value will shift the box shadow to the right, while a negative value will shift it to the left. In the following example, the horizontal offset is set to 20px, or double the value of the vertical offset (which is set to 10px), so the shadow is two times wider horizontally. The vertical offset controls the box shadow’s position on the y-axis. A positive value will move it down while a negative value will move it up. In the following example, the vertical offset has a length of -20px, or double the length of the horizontal offset (10px), so the size of the shadow is twice as big on the vertical axis. Also, since the value is negative, the location of the shadow is offset towards the top of the box. The blur radius property value affects the blurriness/sharpness of the box shadow. The blur radius is optional. If you don’t specify it, it will default to 0. Additionally, it can’t have a negative value, unlike horizontal offset and vertical offset. If the blur radius is 0, the box shadow will be sharp and its color will be solid. As you increase the value, it will become blurrier and more opaque. In the example below, the blur radius value is set to 20px, thus the blurriness is quite pronounced. The spread distance makes the box shadow larger or smaller in all directions. If it has a positive value, the box shadow will grow in size on all sides. If it has a negative value, the box shadow will contract on all sides. As you can already tell by its name, the color value sets the box shadow’s color. It can be specified using any CSS color unit. Specifying a color value is optional. If you want a different shadow color, then you’ll need to specify it in the box-shadow property value declaration. Below you can see that even though the foreground color of the div is still red, the box shadow color is blue. This is where you can get really creative with this CSS property: You can apply more than one box shadow on an element. In other words, you can have multiple box shadows by separating each property value group with commas (,). In the following example, there are two box shadows: A red one at the top-left side of the box, and a blue one at the bottom-right side. The CSS box-shadow property has good browser support. Using Internet Explorer as the least common denominator, the property has been supported since IE 9 (which was released in 2011). You can see a live demo of all the box shadow examples used in this article by clicking the button below.